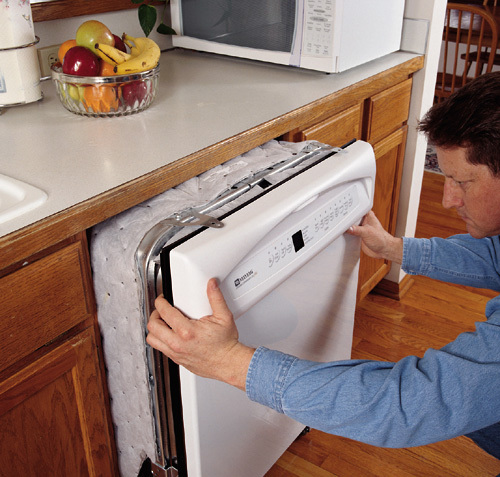 Replacing your dishwasher is easier than it seems - in most cases, you won't need any special tools or skills. Our step-by-step guide will show you how to remove the old dishwasher and make the water, drain and electrical connections for the new one. Before you start: Make sure that the new dishwasher is not wider than the old one. If it is, unless you have advanced carpentry skills, you'll probably need professional help to adjust the cabinets before installing the new dishwasher. Getting started: You are going to need a screwdriver (Phillips and Straight), an adjustable wrench, electrical tape, needle-nose pliers, a voltage tester, level, slip-joint pliers, wire nuts and Teflon tape. Shut off the water valve that supplies water to the dishwasher. Then, turn off the electrical circuit that supplies power to the dishwasher or unplug it from the outlet. In front of the dishwasher, you are going to find two screws that hold the dishwasher to the countertop. Unscrew both screws and gently slide the dishwasher out. Follow the electrical cord to the junction box, usually on the lower rear side, and remove the cover. With the voltage tester, ensure that the circuit is off and disconnect the wiring. After doing that, remove the electrical cord from the junction box and place the wire nuts on the ends of each wire. Under the dishwasher, you are going to find the inlet water line. Remove the nut that holds it in place and remove the water line. Then, locate the drain line under the sink and disconnect it from the dishwasher's drain line. After this step, the dishwasher will be completely disconnected. Attach the new dishwasher's drain line with the help of the needle-nose pliers and wrap Teflon Tape around the threads on the water inlet connection and connect the 90 degree brass fitting needed to connect the water line. Then set the dishwasher upright and connect the water line to the 90 degree fitting. Underneath the dishwasher you are going to find a retaining sleeve for the electrical cord. Slide the cord through and tighten the sleeve. Remove the cover from the new dishwasher's junction box and run the wires through the knockout into the box. Using the needle-nose pliers, connect the black wire to black wire twisting the pair together and then tighten a wire nut over both wires. Repeat with the white wires. Tighten the green wire to the green ground screw inside the box and then wrap electrical tape where the wires meet the wire nut. Replace the junction box cover. If you wish to know a little more about how you can replace your dishwasher, click here to watch a video with detailed information. If you need professional help, call your management team and ask them to provide you with the contact of a reliable plumber and/or electrician.